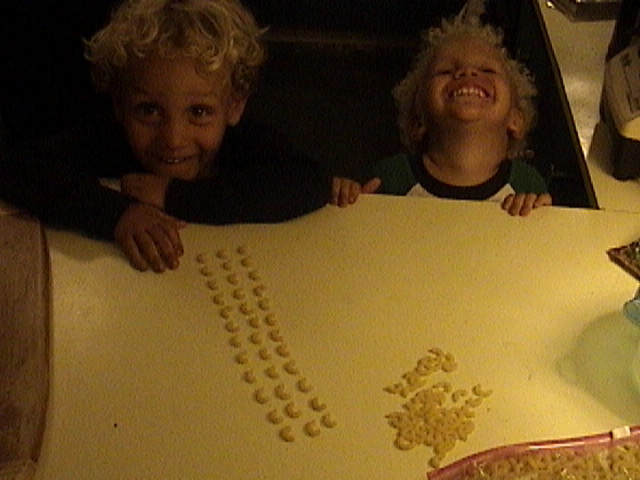 Playing With Macaroni Teaches Math. There are inexpensive ways to play with math concepts. 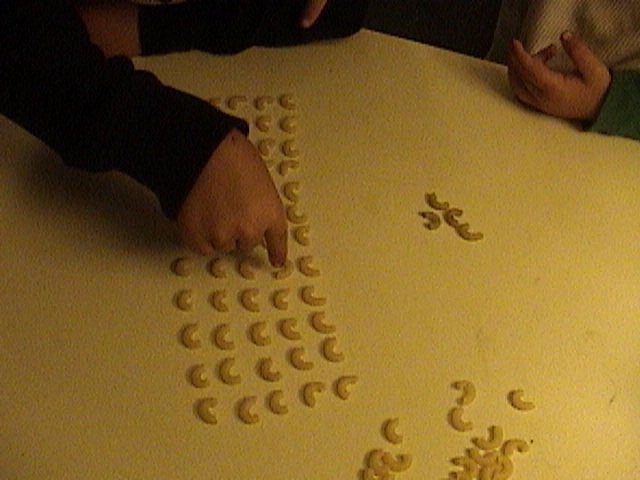 One of the preschool math activities that can be easily converted into a math activity is playing with macaroni. It's fun and you can count lots of times as you add each noodle. Start small and just keep adding. First we just got out three. The younger boy barely has a one to one correspondence developed. Note how we are counting to three and he already has four and is reaching for more. The older boy has three and is covering them so his brother doesn't take from his set. Once they both had three what happens when we but them together? Big question when you are just barely 3. We counted several times. NEVER said NO. Took the negative out of the lesson. If he got out seven instead of three, we just counted all 7, and the child can figure out for himself that's more than three. I directed their discovery of three's. I know 3x3 is nine and so do you. They don't. Don't just tell them, allow them to discover it, then follow up with the mother of skill: repetition. They want to please you, and to get it right...make sure they are always right, and set it up for success. 7 was too many but it wasn't bad or wrong it, it just gave more information: too many. Once we got three counted then we added 2 to make 5 in a row. Then we counted out TEN. We counted lots of times. Both boys taking turns repeating after me and counting with their fingers, pointing to each one. Then we took away some and counted...play with your students. Have fun. No pressure, No stress. 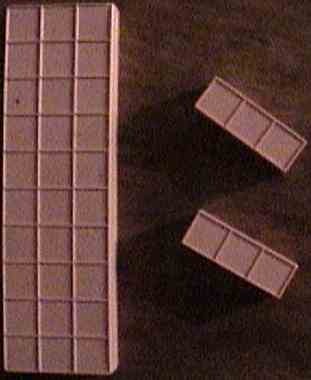 Then because the older boy likes the three song from Multiplication Rock we arranged them in three's. 3, then 6 then 9...hey that kinda looks like a square even though it's macaroni! They thought that was pretty funny. How can macaroni be square? Well, are the sides the same? Pretty soon we have a nice long row. While we were on our way to twelve, we counted by three's, then we counted by fours (3 x 4 = 4 x 3) etc until we could count by tens! But we didn't stop there, we counted to 36 the "long way" by 3's and then the "short way", by 12's. Now, it was getting near bedtime and I asked them if they had had enough and wanted to go to bed or if they wanted to keep playing. We were having fun and this is a good time to stop. You know you are doing it right when you here "Awwwwww...let's play some more." So we kept going, mindful that we don't want to go past the point where it's fun. ALWAYS LEAVE THEM WANTING MORE. First we added another row of 12 counting by fours one at a time as we turned a three into a four...then to their AMAZEMENT it got easier to count! We made rows of 5! Counting by 5's is easier than counting by 3's OR 4's. Math teachers always want to go in order and will almost fight me on this. You just have to do 2's, then 3's, then 4's, then 5's and so on. Says who? Does it matter what order we go in, really...? Actually, the answer is YES, keep it easy and fun and more gets done in less time. Do the easy stuff first. That's the order you go in: easiet to hardest. Now they have a memory peg for each table. More on this later and elsewhere. But briefly; they know 5 x 6 is 30 for example, now 6 x 6 is easy it's just six more: 36, and 4 x 6 is easy (though not as), it's just 30 minus 6 which is 24...that's pretty easy because we have been building tens and we know six and four go together. See how it all fits together? Now it was getting late and the were still having fun but rather than go to sixes we played a silly fun game where they would hide and I would turn one of the noodles the other way and they would have to find it. Note the 4 grubby dirty non-edible won't be going back in the food bag macaroni that appear and disappear in the pictures. He did not wash his hands before the lesson. The older boy started doing it with ease but still had fun, the younger boy took MUCH longer to find it. It was a big deal when he did and there was much clapping and laughter every time. Then we turned two at a time...then three...then it really was time for bed...and a good hand washing. Most important: we had fun. 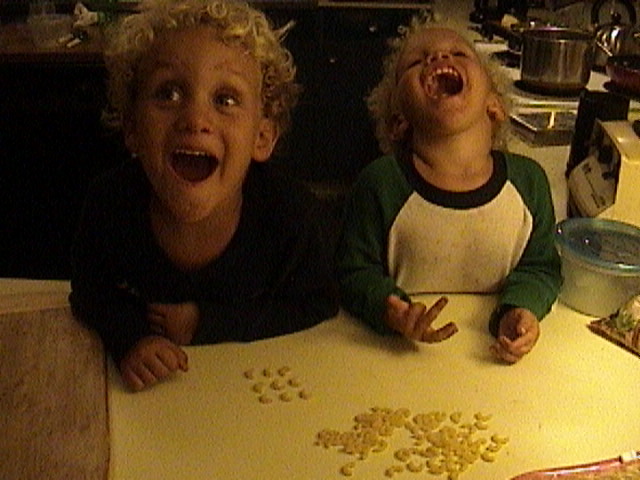 Next time we get out a bag of macaroni they may not remember the whole entire lesson in the conscious mind but they remember they had fun. The brain wants to work fast. Getting out single manipulatives for big problems is the downfall of many a good manipulative program. It takes too long and the student gets bored long before the problem is built. With the right manipulatives bigger is just "funner". Use the right tools for the right ages. For young students macaroni (or raisins, or M&M's or whatever) work great. Once they get older counting out units takes way too long. So being able to grab 30 is GREAT. Then getting manipulatives out for counting by threes to twenty takes no time at all. Here we have all we need for 3x12. 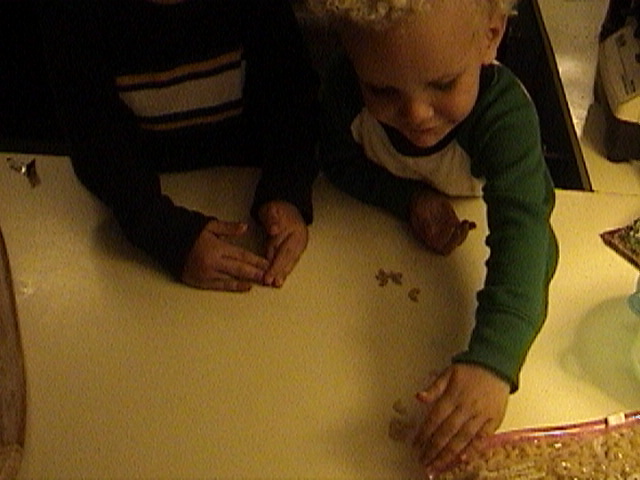 With the macaroni, you want to talk about developing fine motor skills? Should be obvious, so you talk about it if you want to, I'm doing something else. My son got this right off, I was confused for a second. I was thinking "they are all candy, and some are square and oh...duh." More FUN Pre-school Math Activities HERE. 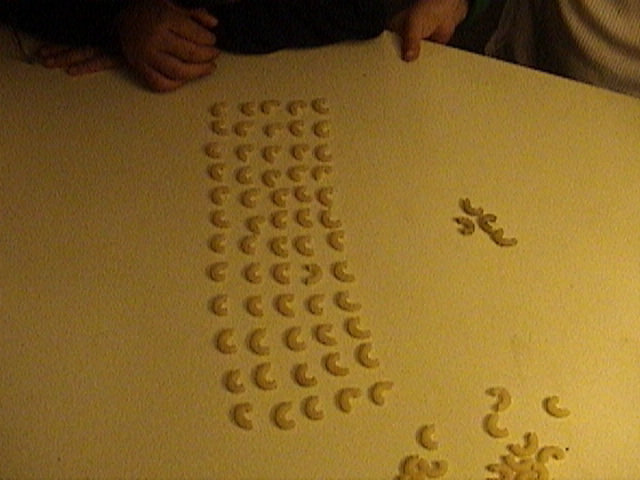 Go from preschool math activities macaroni back home.